July, July, what happened to July? And I'd thought June had flown by. Before you know it, summer will be gone, the kids will be back in school. The proof? My son received his teacher assignment on Saturday! My goal for August: slow down time, spend more of it playing with the kids and less on the computer, see Coldplay (in 10 days - whoop! ), take a mini-vacation to CLOUD 9 Country. Can't wait! Reading in July was sluggish, with a lot of false starts. 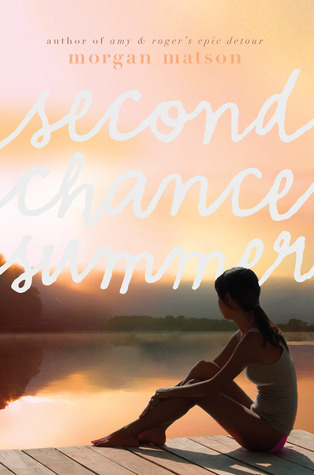 Easily the best book of July was SECOND CHANCE SUMMER by Morgan Matson. Oh, this is my kind of book, with all the things I love: summer, the lake, family drama, first love. I recently had a conversation with one of my critique partners, Kari, about seasons in our writing. She's more of a new beginnings writer, the start of the school year. Of my four novels, three of them take place during the summer. Summer is not my favorite season, but I have fond memories of childhood summers, and I'm drawn to those experiences. Every summer we met up with family on my dad's side for a week at a cabin on the Whitefish chain of lakes in Pequot Lakes, Minnesota (CLOUD 9 Country). We had parties, played Scrabble, went fishing, sunbathed, shopped. There was golf and water-skiing and mini-golf and bumper cars (although I only participated in half of those. You guess which ones). I love the sunshine and blue sky of summer. I love thunderstorms and the green sky aftermath of severe weather. I love the smell of zucchini on the stove and burgers on the grill. I love sunning myself on a floatie in my sister's pool, early morning reading or writing on my front porch before the brutal heat of the day kicks in. If it weren't for that heat and, even worse, the humidity, I might love summer. But I don't love summer. I love the idea of summer and aspects of summer and writing about summer. I love books that capture the experience of summer. And I loved SECOND CHANCE SUMMER. Morgan Matson handled this topic with respect and honesty. It's a beautiful, heart-wrenching story. From the first page, I was rooting for Taylor and wanted her to find a way to patch things up with Lucy and Henry. Mostly, though, I wanted her to connect with her dad before it was too late. There were moments in this book that brought tears to my eyes and then, toward the end, the tears spilled over. My five-year-old daughter touched my shoulder at one point and said, "Mom, are you crying?" "Well, just skip that page," she said. In life, you can't just skip the page. I lost my dad to cancer nearly six years ago, and many of the emotions in this book were familiar and raw. My situation was quite different from Taylor's, decades of difference. I was a grown-up, pregnant with my second child, my father was 75, had raised seven children, and had lived a good, long life. But that doesn't make losing a parent any easier. Like Taylor, there were many moments during my father's nine-month battle with lung cancer that I wanted to run away, pretend it wasn't happening. It happened. Life -- and death -- happens. You can't skip the page. Imagine what you might miss. Even amongst all the pain, you might miss something beautiful. Tell me, what was your Best Book of July? Are you drawn to books (or do you write them) set in one season over another? A book can touch you in many ways and I loved this one, as you know. I'm so sorry about your dad and I'm sure there were indeed moments where the reading was difficult. Hope you have a wonderful day Sara! Still haven't gotten to this one yet, though I'm not sure why. Maybe because of the death aspect? I tend to tippy-toe around those ones. But Morgan Matson is a great author, so I should trust her a little more with it. My fave book of the summer was Under the Never Sky by Veronica Rossi. It had its flaws, but it was compelling. As far as what season I focus on in my novels? Not any particular one, but I tend to have about a 6-month span in the storyline. Loved this, though: "Life -- and death -- happens. You can't skip the page." I don't think I gravitate toward any one season, really, though I'm a big fan of the fall in general. I always feel like fall (even more than spring!) means starting over, new beginnings, etc, probably because it's the start of the school year and it just stuck well beyond my school years. I love summer. I love the heat and the sun! I know I'm crazy. I love reading about it too. I don't know if I could read a book about losing a parent though. I lost my dad to cancer a while ago. That pain is something I don't know if I want to relive. I'm sorry about your dad. I loved the simplicity of your daughter's solution to skip a page. But I teared up at this: "Imagine what you might miss. Even amongst all the pain, you might miss something beautiful." One day I will write a book that takes place in the summer. I wonder if a summer book for me would be the end of something, since fall is typically a beginning for me? Best book this July? DAUGHTER OF SMOKE AND BONE and MY LIFE NEXT DOOR. I can't pick one.